Whatever you want to call them, cylinders, tanks or bottles are the transportable high-pressure vessels that contain the gas you are going to breathe. They can be made from steel or aluminum. Steel cylinders usually have a rounded bottom for weight-saving reasons, so they are fitted with a rubber base to allow them to stand upright. Aluminium cylinders, because their metal is much lighter, can be made with a flat bottom. Steel is much stronger than aluminium, so to add strength, an aluminium cylinder has much thicker walls and this can make them bigger. With less weight and more water displaced, using an aluminium tank means wearing more lead weight to compensate in the water. Often, aluminium cylinders of the same volume weigh more out of the water than a similar volume steel cylinder. The cylinder or tank has a valve screwed into the aperture at the neck. This is a cross-flow valve that works like a tap. You open it to let the gas out or close it to keep the gas in. There is a fitting that matches that of the regulator so that the regulator first-stage can be given an air-tight connection. These cylinders are aluminum as shown by their flat bottoms. Because they are bigger, they weigh more at the surface and displace more water than steel cylinders. In the United States, tanks are measured by the volume of compressed gas in the tank, for example, 80 cubic feet. In Europe, Australia and New Zealand, tanks are measured by water capacity, for example, 12 L.
If you are in Europe, you can calculate the amount of gas in a tank if you know its internal volume and the pressure to which it has been filled. For example, a 12-L cylinder filled to 200 bars (300 psi) of pressure contains 2,400 L of gas. The pressure gauge of the regulator gives you an easily read figure and the internal volume, often calibrated as WC, is embossed on the outside wall of the tank, near its neck. Some cylinders are routinely filled to 232 bars (3,365 psi) of pressure while others may even take 300 bars (4,400 psi) of pressure. The more gas that is squeezed into a tank, the longer it will last. The maximum working pressure (WP) is embossed on the outside of the tank together with a maximum test pressure (TP). Because cylinders or tanks are filled to such high pressures, they need to be regularly tested in case of failure. A tank that fails under pressure would be lethal. In the UK, a visual test is carried out every two and a half years and a full hydro test every five years. The expiry date of the test is stamped on the tank so that the person who fills it knows that it is safe to do so. 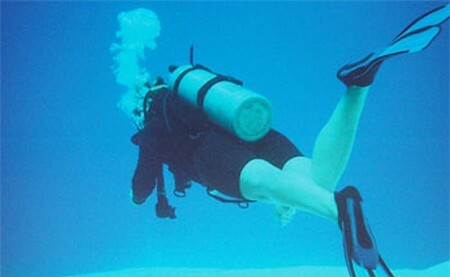 It’s important to carry sufficient gas to complete the intended dive. This will depend on depth, the time needed to do the dive and the breathing rate of the diver. How to Design Your Own Tanning Bed?